Niddry Castle oil works, pictured c.1910. The two chimneys on the horizon probably mark the locations of Philpstoun oil works and the derelict Champfleurie oil works. There are more than 130 sites in Scotland where crude oil was at some time produced from coal or shale, or where this crude was refined into oil products. The vast majority of these works were small scale and short lived enterprises; many the products of the Scottish "oilmania" of the late 1860's. Only a dozen crude oil works remained active by the start of the 20th century. "this number may possibly have been greater, as there is a liability that one or two unimportant and small works may have existed for a short time and have escaped the Author's investigations". Redwood's list was used as a starting point for this gazetteer and various research has attempted to identify the location of the listed sites and verify them through reference in other historical documents. This process identified some duplication of locations on Redwood's list, and left a handful of sites unidentified or uncorroborated by other sources. Research also revealed a number of likely shale or coal oil work locations that were not listed by Redwood, although some care is needed to differentiate these sites from the broader activities of the oil trade. Scotland had an advanced oil and chemical industry long before James Young's discoveries. Oil works, mainly in the east coast ports, processed whale, seal and fish oil to produce lamp fuels, candles and lubricants. In numerous oil mills, seeds were ground to extract oils used as lamp fuels, paint solvents, and for culinary purposes. Oil and tallow works, often built close to slaughterhouses, produced a range of oils, candles and greases, whilst the by-products of the gas industry were refined to produce tars, benzole, naptha and other solvents. All of these industries continued in parallel with shale and coal oil production during the Victorian era, as did a growing trade in imported crude petroleum and mineral oils. Use of the terms "paraffin" or "shale" is usually sufficient to distinguish shale or coal oil operations from the activities of the wider oil trade; in most cases however further evidence is available to justify inclusion of a site in this gazetteer. One of the few contemporary histories of the early days of the Scottish oil industry is contained in "A Practical Treatise on Mineral Oils and their By-Products, written by Iltyd. I. Redwood in 1897. Redwood had a long association with the Scottish shale oil industry and first hand knowledge of many of its leading figures. His anecdotes of the Oilmania period provide unique insight into those times and offer a wealth of detail that generally coincide with the few official records that survive. 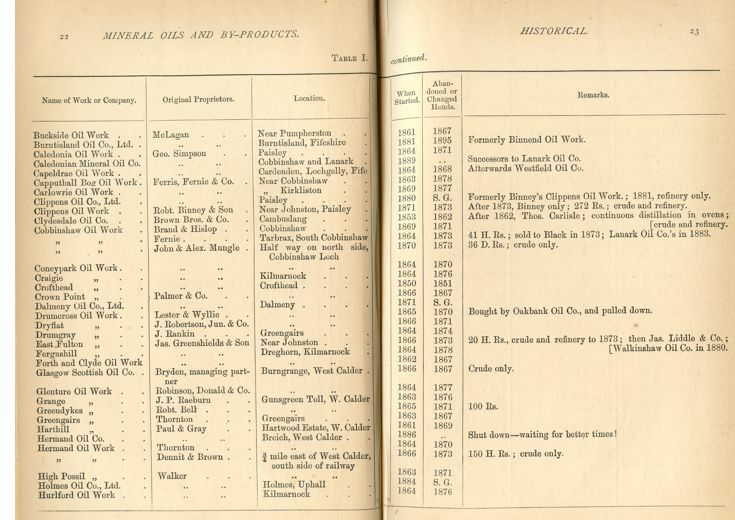 The book contains a table listing 117 different shale and coal-oil works in Scotland, their owners, dates of operation and other details. Some sites are only known from this table. Unfortunately the table contains many errors that were presumably introduced during transcription from manuscript. This has introduced some bizarre spelling of place names, a few errors in dates, and the occasional mix-up between entries. Nevertheless the table remains a superb research resource when carefully interpreted.